1. Jesikah Orman (Lowertown Lofts Coop 5th Atrium): works in mixed media on wood panel and canvas. In her “Over/Under project,” she uses screenprinting to explore design in textiles, paper, wood, and other materials. 2. 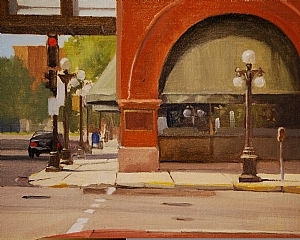 Richard Abraham (Northern Warehouse 510): plein-air painter featured in the Minnesota Originals series. The color and brushwork in his landscapes will take your breath away. 3. Derek Davis (Northern Warehouse 417): plein-air painter whose beautiful color harmonies and design will change the way you look at nature. 4. Chris Faust (Northern Warehouse 210): photographs the changing rural and urban landscape. Simple subjects—huge impact. 5. Cheryl LeClair-Sommer (Northern Warehouse 417): pastels and oils in lively color, across a range of subjects, including plein-air landscapes and city scenes. 6. Jeffrey F Morrison (Northern Warehouse 619): his bio reads: Installation Artist, Multi-Disciplinary, Muralist, Painter, Performance Artist, Sculptor. I would only add: “brilliant.” Connects his art and his social conscience without compromising either. 7. Joshua Cunningham (Grand Hill Gallery, 333 Grand Ave): award-winning plein-air painter captures light, seasons, and moods in every painting. 8. Neil Sherman (Grand Hill Gallery, 333 Grand Ave): Grand Marais plein-air painter who is working on a unique project: painting the 277-mile Superior Hiking Trail. His love of the North Shore permeates every work. 9. Don Biehn (Lowertown Commons Atrium): impressionist paintings in oil and watercolor. Subtle colors, rich textures, marvelous paintings! 10. Chuck Koosmann (ACVR Warehouse 4th floor): he doesn’t photograph “things,” he photographs experiences, essences, attitudes, personalities—get the idea? Remarkable photos.